WEST LAFAYETTE, Ind. -- Researchers have discovered the structure of a key protein on the surface of an unusually large virus called the mimivirus, aiding efforts to determine its hosts and unknown functions. "I wouldn't say it infects humans, but it can propagate in humans because macrophages take up this virus and it can propagate in these," said Thomas Klose, an assistant research scientist at Purdue working with Rossmann. "Overall, there are many unknowns." Research findings will appear in the June 2 issue of the journal Structure. The R135 protein likely plays a key role in the virus's relationship with a smaller, "satellite virus" aptly called Sputnik. Sputnik is referred to as a satellite virus because it can only be propagated in combination with another virus, in this case the mimivirus, which infects amoebas in laboratory research. While inside the single-cell amoeba, the DNA for both Sputnik and mimivirus are replicated, allowing the viruses to multiply. "It is very likely that this R135 is the protein that Sputnik uses to co-infect with mimivirus," Rossmann said. The Structure paper was authored by Klose; Dominik A. Herbst, a former intern and now a graduate student at the University of Basel in Switzerland; Purdue graduate students Hanyu Zhu and Joann P. Max in the Department of Chemistry; Hilkka I. Kenttämaa, a professor in the Department of Chemistry; and Rossmann. A Mimivirus enzyme that participates in viral entry Thomas Klose,1 Dominik A. Herbst,1,2 Hanyu Zhu,3 Joann P. Max,3 Hilkka I. Kenttämaa3 and Michael G. Rossmann1,* 1 Department of Biological Sciences, Purdue University 2 Current address: Biozentrum, University of Basel, Klingelbergstrasse 3 Department of Chemistry, Purdue University * Correspondence: Michael G. Rossmann, Department of Biological Sciences, 240 S. Martin Jischke Drive, Purdue University, West Lafayette, IN 47907-2032, USA. Tel. :+1 765-494-4911; Fax: +1 765-496-1189; E-mail: mr@purdue.edu Mimivirus was initially identified as a bacterium because its dense, 125nm long fibers stained Gram-positive. These fibers probably play a role during the infection of some host cells. The normal hosts of Mimivirus are unknown, but in the laboratory Mimivirus is usually propagated in amoeba. 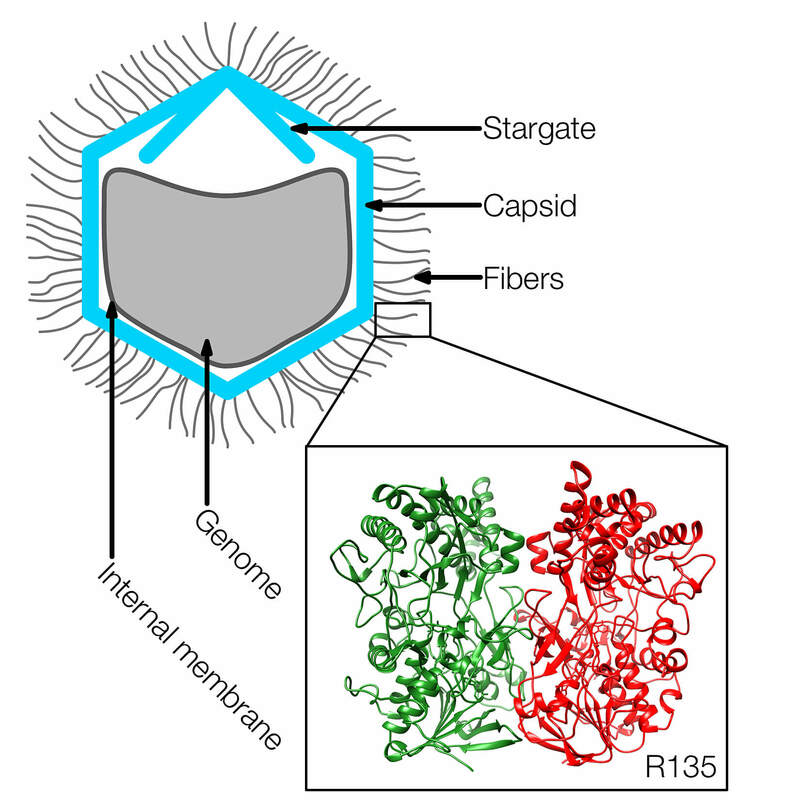 The structure of R135, a major component of the fibrous outer layer of Mimivirus, has been determined to 2Å resolution. The protein's structure is similar to members of the glucose-methanol-cholin oxidoreductase family, which have an N-terminal FAD binding domain and a C-terminal substrate recognition domain. The closest homologue to R135 is an aryl alcohol oxidase that participates in lignin biodegradation of plant cell walls. Thus R135 might participate in the degradation of their normal hosts, including some lignin-containing algae.